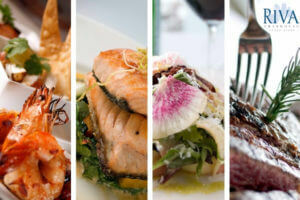 Riva Offers Chicago’s Best Holiday Party Venue & Menu! Though the leaves haven’t even started to change color yet, it’s never too early to book your company or family holiday party. Securing the perfect venue is the most important item on the party planning checklist, and because many planners like to wait until the last minute, it’s essential to book your location as far in advance as possible. Chicago’s only lakefront seafood restaurant, Riva Crabhouse on Navy Pier, offers the finest dining views in Chicago. Whether your holiday party is casual or calls for a more formal setting, we create menu options that fit all holiday party needs. And as a special thank you to our guests who book with us in advance this year, we’re offering an amazing $50 gift card for every $500 you spend if you reserve your party by Oct. 31, 2018. All our menu items are prepared fresh, using only high-quality ingredients. Choose from menu items like Mission Fig and Cheese Canape and Lamb Chop Lollipops for starters; Atlantic Salmon and King Crab Legs for entrees and a selection of our amazing desserts. View our full private dining guide by clicking here. The Lighthouse Room — seating for up to 50 guests. The Chicago Room — seating for up to 60 guests. The Lakefront Room — seating for up to 100 guests. Whether you’re planning a party for your entire company or a group of family and friends, Riva Crabhouse on Navy Pier will create a lunch or dinner to remember. Call our Private Dining Manager at (312) 447-7450 today to discuss your holiday party.